The last of the fire signs is certainly not the least, as the Sagittarius woman is a seeker of truth and knowledge. Curious and resourceful, she is quite the philosopher and will stop at nothing to learn all she can about the workings of the universe. Life is an endless journey for the archer, as she strives to learn anything and everything about what it has to offer her. She is incredibly optimistic, which allows her to maintain an open mind about all she discovers. Vibrant and charming, she attracts anyone who is looking to feel good about themselves and the world in which we live. The Sagittarius exuberance is infectious, as is often detected through the various conversations she enjoys with anyone willing to teach or learn. She loves to travel, often at the drop of a hat, which makes it difficult for her to stand still for any length of time. With this in mind, the best careers for Sagittarius women are tourism, sports, entertainment, missionary work, or publishing. Other jobs may be suitable for her as well, as long as she is constantly challenged and able to climb the ladder. She is always reaching for the highest rung, and once she has reached it will grow bored and go looking for another goal to achieve. Keeping the Sagittarius lady satisfied can be difficult, but she doesn’t mind moving from place to place. So any business where she has to travel extensively will be right up her alley, since she doesn’t feel the need to plant roots. 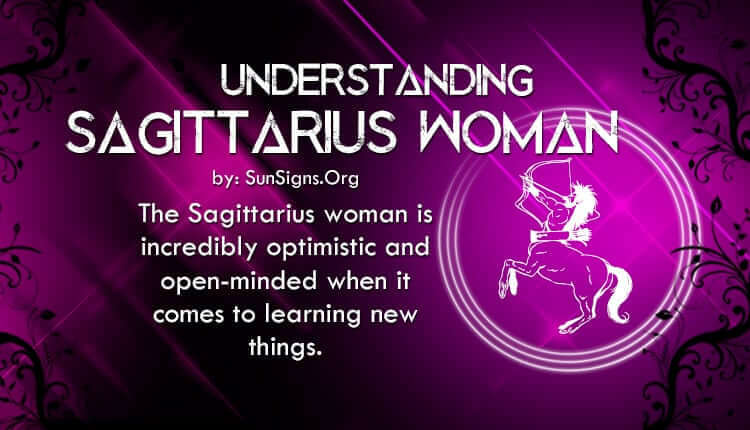 Because of her adventurous nature, a Sagittarius female is an exciting friend to have. She is very sociable and loves trying new things, so expect to hang out at different restaurants and entertainment venues on a regular basis. She is warm, outgoing, and hilarious, which allows her to get along with anyone. Her inner circle is constantly growing as she collects more friends after each new experience, which can also mean some people get left behind in the group. Because she is constantly on the go, she may not realize how long it’s been since she has hung out with some of her companions. She can be somewhat scatterbrained since she doesn’t make plans – who has the time to stop and make a schedule? But she will always come back around to her closest confidantes with whom she had the greatest of adventures. Despite her sometimes flighty nature, the archer will take careful aim when she chooses a lover. She has to be cautious, for she needs someone who can hold her hand on any journey she wants to take at a moment’s notice. A relationship with a Sagittarius woman is never boring, and she needs a mate who shares her same zest for life and knowledge. And while she may go off on her own for a spontaneous adventure without you, know that you can be confident in the fact she will return. It is hard to resist her charming and carefree spirit, especially when she treats you as the most important part of her life. Then you know you have won your way into her heart. And when that happens, she will take her time showing you everything she has learned in the bedroom. Her knowledge is quite extensive here as well! Next What Is Persian Astrology?